Brendon Collins, a builder who received an Order of Australia medal in today’s Queen’s Birthday Honours list, had a vision for a community of tomorrow that was truly sustainable and he’s continuing to innovate. 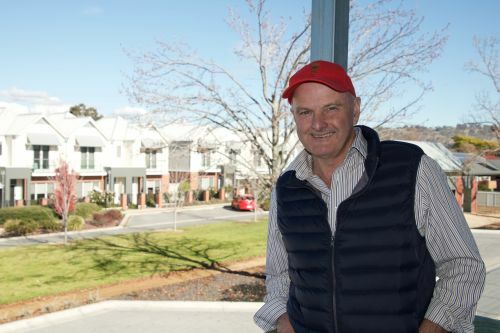 He’s now aiming to offer Australia’s first 10-star energy rated homes in a medium density development in Wodonga. Mr Collins said he felt very humbled and shocked when he was first told of the award. “I didn’t develop Elmwood with winning awards in mind, so to win this award is incredibly humbling. Getting to this day has been a team effort. I couldn’t have done it without the support of my wife, Karen, and with regards to Elmwood, the support of my business partner Henry Dinning and the Lightwood team,” Mr Collins said. Mr Collins said a challenging childhood growing up in Wodonga as one of eight children and having a father who was a Prisoner of War survivor of Changi and the Burma Railway, gave him empathy for others in the community who face difficulties and a strong desire for inclusivity. One Elmwood resident, Rob McDiarmid, 83, says it’s a great community to live in because of its central location and proximity to services. Community activities include weekly lunches where people meet each other and develop friendships. There’s also a community vegetable garden and a nearby Medical Centre and café. Mr McDiarmid said the interior comfort, design and low power consumption were some of the benefits of Elmwood homes. “Our daily cost for gas and electricity is $2.50 a day and that’s without solar panels,” Mr McDiarmid said. The $40million Elmwood development features 115 homes with 7 to 8.5 star energy ratings and won two Master Builders Association awards in 2013: ‘Best Integrated Housing Development’ for Victoria and ‘Best Multi Unit Development’ for the Riverina region. Building started on the site in 2006. The first homes were completed in 2007 and in the same year, Mr Collins built the Elmwood Medical Centre; the region’s first bulk-billed medical centre, including pathology, pharmacy and café. There are 11 house sites still to be built on before Elmwood is finished. Brendon and his wife, Karen, have three sons, who have all won the award Young Citizen of the Year in Wodonga: Dan 2008, Josh 2010 and Tim 2012.